Did you know Chandigarh Airport is 50 years old? In 1967, Chandigarh airport got its first wings to fly when a civil terminal was opened and connected Chandigarh to Delhi. But, it was least worthy of its name. With rudimentary infrastructure and sub-standard facilities, the airport was catering only to IAF and administrative cargo shipments. Things continued as business as usual. In 2006, Chandigarh airport had just 427 travellers a day (i.e. merely 1.5 lakh passengers in a year). A decade forward, the numbers have swelled to whopping 18 lakh now, that’s incredible 1000% growth. Additionally, the number of destinations has also increased from one (Delhi) to 11 domestic and 2 international destinations. HOW THIS CHANGE CAME AROUND? Increasing demand by travellers in the region: The industrialists have been persistently demanding better connectivity of Chandigarh with the country and the nations abroad. The economic boom in the region made the industrialists and businessmen take measures to cut down the freight charges, which unduly increased due to travelling to Delhi first. Also, because of major NRI population in the region, better connectivity was long overdue. New Terminal at Mohali: The major push Chandigarh airport got with the construction of giant terminal in Mohali’s Jheorheri village in October 2015. 2008: From just connected to Delhi, an additional destination of financial capital of India, Mumbai, attracted travellers and flight operators. 2011: Decade-old Chandigarh airport terminal was rejuvenated with modern amenities. Domestic travellers were attracted, but no international flights operated from here, despite being declared a custom airport. 2015: New terminal in Mohali’s Jheourheri village became operational. 2016: IndiGo and Air India started the much-awaited international flights to Dubai and Sharjah. 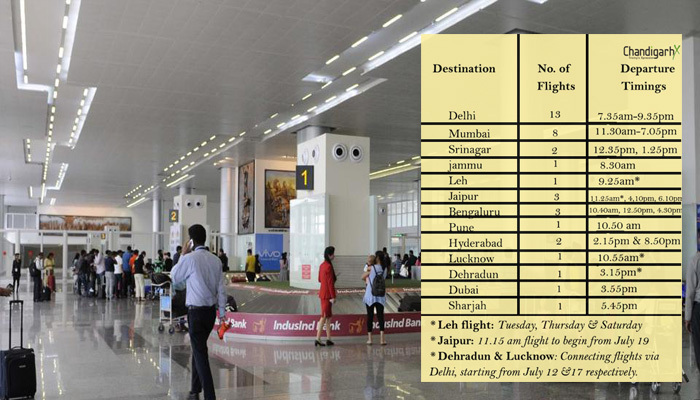 “Around 30% to 35% traffic at IGI Airport in New Delhi comes from the Punjab region alone. Any improvement in the Chandigarh airport’s connectivity will have a direct bearing on the Delhi traffic,” said airport official.